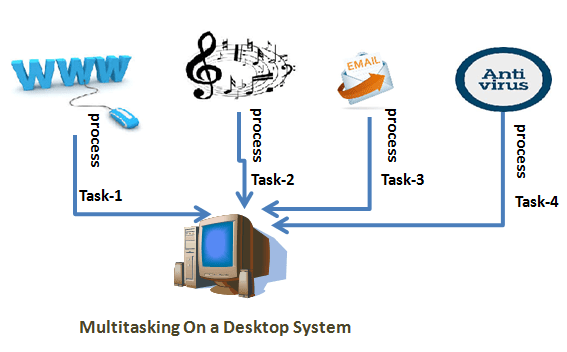 Multitasking is a technique where multiple tasks, also known as processes, share common processing resources such as CPU, Memory etc. With a multitasking OS, such as Windows XP, you can simultaneously run multiple applications. Multitasking refers to the ability of the OS to quickly switch between each task to give the opportunity to execute multiple actions simultaneously on different applications. In single processor system, only one task runs at any point in time, meaning that the CPU is actively executing instructions for that task. Multitasking solves this problem by scheduling which task may run at any given time and when another waiting task gets a turn. You can prioritize each of these threads so that they operate independently. Thus, in multithreaded applications, multiple tasks can progress in parallel with other applications that are running on the system. In a single-threaded application, a synchronous call effectively blocks, or prevents, any other task within the application from executing until the operation completes. Multithreading prevents this blocking. Now a days Operating systems supports multithreading and may be with single processor or multi processor. 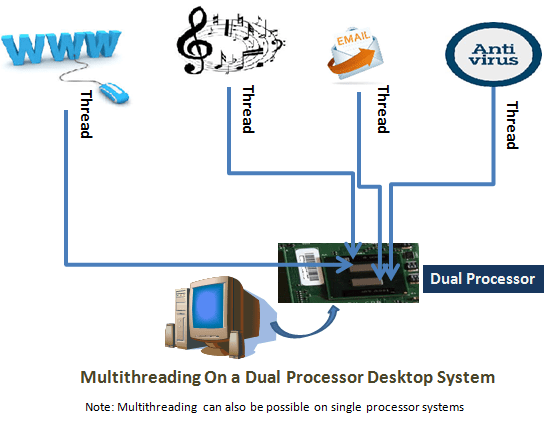 On multi processor systems applications runs more faster as threads are processed by both the processor.